Beautiful basket made of cardboard with a solid lamination and a metal handle. The bright red and wh..
18 pieces. Multicoloured ceramic crockery. Brings colour into a picnic!.. This sweet rattan basket with its 70s style makes these metal dishes the perfect companion on doll´s..
You can take the red wicker-work basket containing a tin tea set with a beautiful heart motif to eve.. 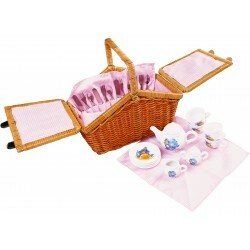 In this wickerwork basket with carrying handle and release fasteners you will find a lot of colourfu.. This fun, colourful and cute Rainbow Unicorn collection was created for believers only. Designed wit..